The free college data site, which was first launched in 2014, now provides updated pricing information for more than 3,800 colleges and universities. It also features an intuitive and easy-to-use lookup tool for information on individual colleges. And it allows users to freely download a spreadsheet so that they can compare the sticker prices, net prices, graduation rates and demographic makeup of public, private and for-profit colleges in the U.S.
There’s a big gap between the “sticker price” colleges post on their websites and the “net price” that most students actually pay. Net price is defined as the total cost of attendance (which includes tuition, fees, books and living expenses) less any grants or scholarships. Only about 37 percent of undergraduates pay their school’s sticker prices, according to the U.S. Department of Education. The rest get aid to reduce the amount they have to borrow or spend from savings. For example, the Tuition Tracker data shows that freshmen from families in the middle of the income distribution — earning between $48,000 and $75,000 a year — on average, cobble together a total of about $10,000 in federal, state and college grants and scholarships, which brings their net cost down to about $14,000 per year at public four-year colleges. And other research has found that private colleges overall award 89 percent of freshmen scholarships equivalent to, on average, half of the school’s sticker price, though that still leaves them will annual bills north of $22,000. Another important finding: The colleges that charge the lowest net prices to low-income Americans also have the lowest graduation rates. Meanwhile, colleges that tend to give their alumni more job market advantages are becoming increasingly unaffordable for students from low-income families. The average net cost for low-income freshmen starting out at public community college full time — including tuition, fees, books, and living expenses and subtracting out grants and scholarships — was $5,977 in the 2015-16, the latest year for which the Tuition Tracker has data. That was up only about 4 percent (about half the rate of overall inflation) since 2010. But the low-income group, defined as those from families with annual incomes below $30,000, are unlikely to have savings or earnings. So that net cost must typically be covered by student loans and student earnings. Unfortunately, community colleges also have low graduation rates. Only about 22 percent of community college students manage to earn associate’s degrees within three years of starting. And only 14 percent of freshmen who start at community colleges earn a bachelor’s degree, the credential that tends to be more in demand with employers, within six years. Meanwhile, the net price charged low-income freshmen at public four-year universities over that same period soared much faster than overall inflation — 15 percent to $7,692. Those students who do manage to scrape together the loans and earnings to cover that net price have a much better chance of success. About half of low-income students at public universities manage to earn a bachelor’s within six years. And private nonprofit colleges, which have the highest graduation rates for low-income students (55 percent), are also the most unaffordable. On average, the net price for low-income freshmen after scholarships were subtracted reached almost $20,000 a year at private non-profit colleges. That net price is about $2,000 (or 12 percent) more than similar freshmen were charged in 2010. For many low-income students, that meant their annual college bills totaled more than their family’s entire annual income. Journalists interested in learning more about analyzing the data in the tool to generate stories can watch EWA’s free on-demand webinar featuring data analysts and reporters from The Hechinger Report, who were key members of the team developing the tool. 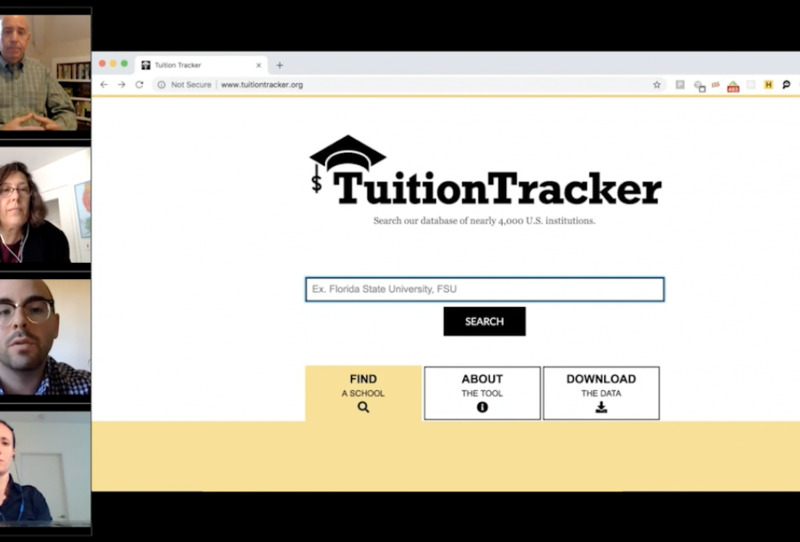 The Tuition Tracker was a joint project of The Hechinger Report, EWA and the Dallas Morning News.